I bought a hat while we were in Columbus. I'm not a hat person, but I guess that can change (or maybe not). I'll let you know after I wear it out for the first time! That hat rocks!!! I bet it will go great for a night in the clubs!! I am a hat freak though... I can't wear them (oy the hair trauma!!) 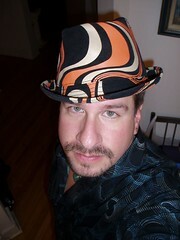 but love to admire them perched upon a hat wearers head.. hehe. Is it a soft material?? I can't tell from the pic. It's more like a heavy canvas. I hope it goes over well otherwise I'll be destroyed! LOL! You should wear that to Work! I am so loving the hat!